Today’s new theme is Notepad. A richly styled and beautiful, personal theme inspired by iPhone’s Notes application. With Notepad you have the option of displaying expertly designed icons that link to your profile on Twitter, Facebook or Flickr. Simply add the appropriate URL in Appearance > Theme Options. There’s even an optional RSS feed icon that fits in perfectly. I really like the Notepad theme’s bubbly drop-down menus—great for keeping all your pages neatly organized—and I think you’ll like them too. I hope you’ll find the Notepad theme’s visual flourishes and careful focus on graphical detail as exciting as I do. Check it out. It just might be the perfect theme for your blog. 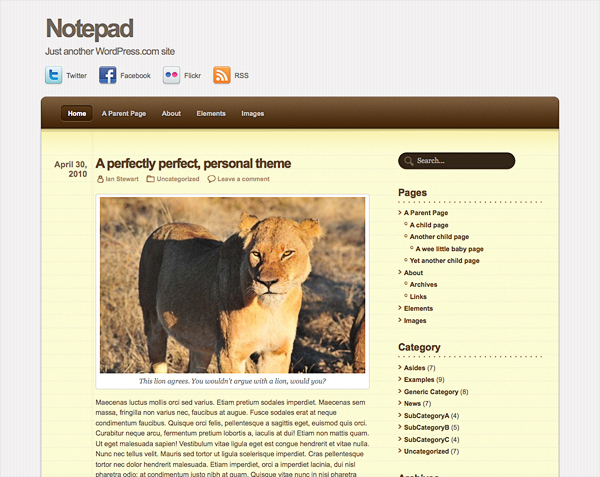 The Notepad theme is available in your WordPress.com dashboard under Appearance > Themes and, for WordPress.org users, in the WordPress.org themes directory. A brilliant theme, thanks a lot. Can you change the theme colour? There aren’t currently any built-in alternate color schemes with Notepad but if you’re experienced with CSS and Image editing that’s certainly something that can be done with our Custom CSS upgrade. Nice. Just don’t like the colors. Beautiful! It’s great that you are including drop down menus in the new themes. I will give this one a look, but I’m very happy with Bueno now that I have the CSS upgrade. And it wasn’t difficult to learn to do at least the simple things like changing fonts and colors with the upgrade. Thanks, Theme Team! Nice way to add your social icons. Keep ’em coming. Thanks WordPress! Wow! You are creating great themes. I like this one but just as with Sandra Lee, I’m very, very happy with my muy Bueno theme. Thanks a lot! This is a really nice looking theme! I like the colors! I probably won’t use it but I really like it! I kinda adore notepads, lol. I wish it had a custom background … among other things … it’s nice though. Another WordPress bomb…You guys rock to the fullest. I will keep on repping WordPress with my Blog updates. Refined with the finest and simplest words. Well done. I’m in love with my new blog on Bueno but I love how this one has the links to twitter, facebook etc! Wow! Just like an org blog! This one looks really great. I would love to use it if we could change color, add header, etc. I really like the theme but the white background behind the images is whats stopping me from using the theme. Very nice indeed! Well done!! Beautiful colours. I’m going to switch themes soon, I reckon. Just can’t resist the temptation for novelty much longer….. Very nice. It has a relaxed and “handwritten” feel to it. Love the drop downs too! I hope you come up with more. I love this one. Almost perfect for an online personal diary. I wish I could customize the image header or the colors. Ian… great theme. Very nice. Some of my team are already using it! Lol. Wow, it’s not for my needs but it looks amazing and I’d definitely would think of using it for a more me-centered blog. I don’t like the colors, personally, but it’s perfect for an online diary. Very nice. It’s only going to get harder to stick with a theme choice for more than a couple of weeks from here on in. Good work theme team! Nice work, a winner… shame about the colour. Oooooh… This is simply marvellous! I love the colours, drop down menu, style, (almost everything actually). Well I do enjoy the brown. I like it… might be actually worth switching to. Beautiful theme! Excellent theme for a WordPress.com blog. Good, good. I like this one. Hmm… the brown and the tiger look good. Nice theme… I like it. Great theme… so much potential if you could offer other colors. This is so cute and stylish! I love it – the colors are really warm and beautiful. I love the lion. For myself I would need something that isn’t so obviously masculine. Nice! I really like the brown/yellow layout, but more colors would be great too. Looks really nice and useful! Great theme, just wish it had a custom background and custom header, then it’d be perfect! The drop down menu design is awesome. I also like that the foreground isn’t white. Amazing! I love it so much. It’ll be perfect for a writing-oriented blog like mine. I’ll consider switching, definitely. I like that you said “Today’s new theme is…” like new themes are the norm. Enjoying new theme news so much. Notepad’s so clean, cute and pop-uppy (not a word, but oh well). Would be awesome if it had more colour choices. I’m looking for something with 3 columns at the moment. Hopefully it will come soon. The theme team is awesome. Keep it up guys. This is a stunner … I’m off to give it a go … cheers, mate. Looks pretty good but scared to change! It is a good theme that is organized nicely, but I hate those colors! This is good!!! It doesn’t seems like “the real notepad” in windows … This is great!! Nice and stylish work! Having other theme colors would be nice too. It’s quite simple for the personal blog. Cool! I like it, very nice. Thank you so much. I’ll try it for my blog. Great theme, I just don’t like the colors 😦 Maybe in a blue? Or green? I like but I wish that there was some choice for the color—It is so hot in the eyes. Plus, I wish that there were some featured post too. Had switched to this theme… I love how my social networking sites are being part of my blog. Good Job! This is such an elegant theme on the whole. What a pity the colours are not brilliant. Very clean and soothing theme, except the background color, it should be changed to white. I love the colours. I probably would have chosen this if I hadn’t found Motion first. I think that the one that I already have probably goes better with the name and subtitle of my blog. I might have to create another blog to be able use this one. I really, really like it. Terrific!! I’m going to change my theme as fast as I possibly can! Each theme introduced always has something missing, with this one, its the choice of colours, with others its that you can’t choose the width, or choose the header etc. I just wish you would give us all a theme that had everything in it. Customised header, customise width, background,colours, etc. There’s always something not quite obtainable for me. All these new themes are BEAUTIFUL, but they have one tiny, tiny thing in common, that makes me sadly ignore them right away. Without even the smallest of hesitation: They don’t show the submission time for each post! If I write two or more posts each day, I want to display the hours and minutes of the post, to keep track of things. Could you have an option to switch on and off the display of the time, maybe, to meet everyones’ needs? I truly love the Bueno theme, by the way!!!!!!! Would LOVE to see it with time stamp! WOW, very hot 🙂 and icons for Facebook, Twitter, and Flicker are really amazing! I Just activated it on my iPhone blog :). Finally! An iPhone type theme! Can we get more iPhone type themes? I like it but am unsure about the caramel colour scheme. Links to my Twitter/FB/Flickr accounts? I thought it was share-buttons. Now that would’ve been totally awesome. Gimme! That said, this theme is really beautiful. This is a cool theme. I definitely like it. Looks pretty good, but from a design point of view, I think the social icons are a large for the location they’re in. To me, it seems like they’re interrupting the flow of the page, and the relative size of them is distracting. I suppose aligning them to the right, in line with the site description and then bumping the content up to the current location of the social icons would take away that jarring effect. Nonetheless, that’s just my opinion, and I appreciate all the hard work WordPress is putting into these themes. What a beautiful theme! This is the first theme that I’ve REALLY liked for a long time. 1. I hope those twitter/facebook icons will make a migration to all other themes. I love them. I’ve been waiting for a notepad/notebook theme for a long time! I will use this for now, but I’d still like to see a notebook theme. I’m not a fan of this one’s colors, but the Twitter and Facebook buttons are awesome. Wow. One word: AMAZING! I will change my theme soon to notepad. It is perfect for a personal blog. GOOD JOB!! I love this layout, and I don’t mind the colors either. 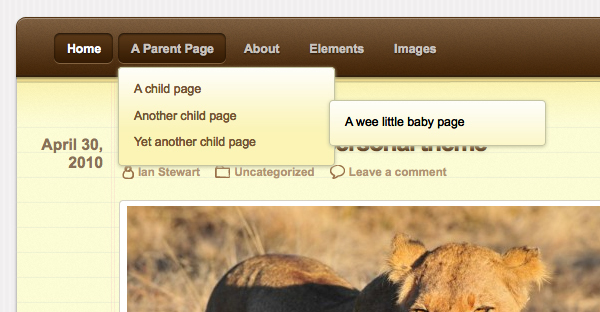 Thanks for that, WordPress.com theme team. I like the theme, just not crazy about the colors. Good effort. It’s beautiful. But, like others, it italicizes block quotations in full, requiring a CSS upgrade to make it useful for me. I love that wordpress is finally adding social network link icons and the like in the themes they make it so much easier to connect. Oh what a lovely theme….great layout ! Any development for other colours? This has potential. Overall a great theme with the look of a book. This theme is definitely on my “like” list. If I could have this theme with just darker colours, I’d change to it in a heartbeat. This is amazing! I love it! The colors and everything. Very nice. Why not just let non upgrade-users make simple background color changes? In this instance, The Notepad background is tied a little too tightly to the design to make simple background color changes easy. Love it. Brilliant. Just what I was looking for. Thank you! Not for me, but cool nonetheless.